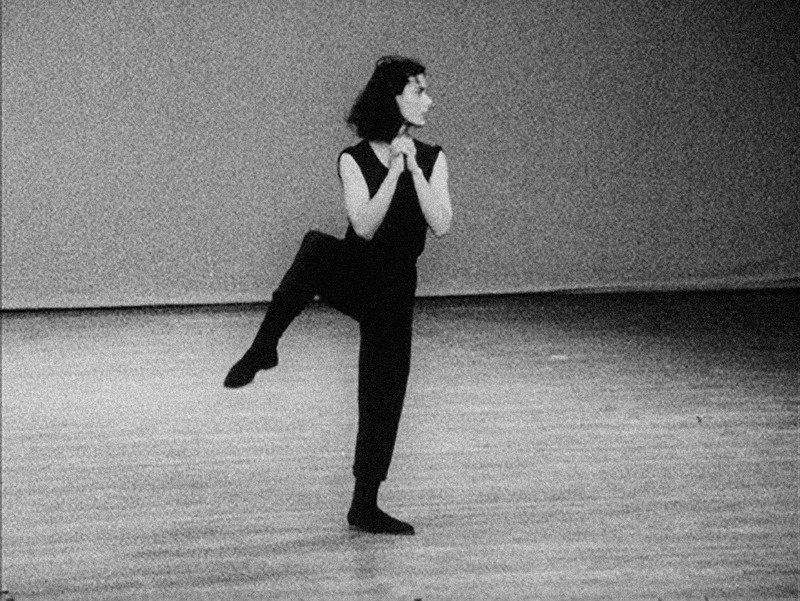 Yvonne Rainer’s Trio A is a masterpiece in movement. The work, choreographed over a period of six months in 1966, is part of a larger work titled The Mind is a Muscle. Currently on view in the contemporary galleries is a solo performance of the same piece, filmed in 1978 on 16-millimeter film in Merce Cunningham’s studio. Today Rainer is celebrated for her many contributions to modern dance and film. Continually exploring the relationship between dancer and audience, she pushes against the conventions of classical and modern dance. The video of Trio A captures, in a way photographs cannot, the subtlety of her actions. Bending, tapping, gliding, twisting, pacing, turning (all without looking at the camera!) the precision of Rainer’s seemingly simple gestures is mesmerizing. I could not always reconcile what I knew to be the required gesture…with the limitations of my body as I wobbled, tripped, and fell. My knees didn’t bend the way they were supposed to; my sense of my center of gravity and balance was totally off; and as Rainer once said to me, her brow furrowed with concern, “Do you even know how to run?” For it turns out that most of our received ideas about this dance are slightly misleading; it is not full of “everyday” actions (for instance, it includes a free handstand in the middle of the room, and balance en demi pointe while wearing tennis shoes). Rather, it is exhausting, it is strenuous, it is very physically challenging, and Rainer has incredibly precise ideas about the ways the body needs to configure itself, where exactly the gaze should land, how even the fingers should be positioned. One does not sloppily move through a series of somewhat improvised or random motions; every tiny movement is prefigured, and it takes a great deal of concentration and work. Far from a free-form, unstructured terrain of unconstrained movement, Rainer’s instructions were a reminder that dance, though it can be deeply pleasurable, is equally a discipline, concerned with techniques of training and regimes to shape the body. After rereading Bryan-Wilson’s “Practicing Trio A,” I had the privilege of going down to Big Picture: Art after 1945 on the third floor and watching the work again. My experience was dramatically different this time around; with extra attention paid to the smallest of Rainer’s gestures (which the film’s “Details” section facilitates), it became clear how much intentionality is imbedded in every action. There is magic in the way Rainer effortlessly configures herself in space, but it is far from effortless—each moment is measured and calculated. Rainer just makes it look easy. Julia Bryan-Wilson, “Practicing Trio A,” October 140 (Spring 2012): 59. If interested in reading the essay, you can access the PDF here: http://arthistory.berkeley.edu/pdfs/faculty%20publications/Bryan-Wilson/jbwpracticingtrioa.pdf.